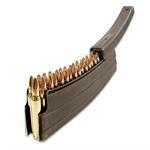 AR-15/M16 30-Round Magazine. Black Teflon/Gray Follower. C Products Mfg. AR-15/M16 30-Round Magazine. Gray Teflon/Orange Follower. C Products Mfg.